Gifts of Cash The simplest way of giving and the most beneficial, is to give a tax-deductible cash donation. You have the ability to specify which program(s) you wish to support or you may designate money for special projects/funds. Print our donation form to include with your donation or donate via PayPal. 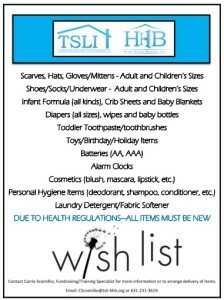 Donated Items You can also help by donating items on our Wish List. You will receive a written acknowledgment of your donation on which you may place a monetary value. Your donation is tax deductible. Annual Event TSLI/HHB holds a Human Services Award Dinner which honors a private sector individual who, through his or her often unheralded efforts and contributions, have significantly advanced the interests of the disabled and disenfranchised. This yearly event is held on the third Thursday in November. Various giving levels are available. Silent Auction Prizes An important part of our fund raising dinner is a Silent Auction. Guests bid on donated items and the proceeds go to our programs. You can help by donating a prize. Some examples are: gift certificates to restaurants; limousine services; tickets to shows and sporting events; vacation time in a condominium or time-share; jewelry; electronic items; etc. Donation Drives Another great way to help is to conduct a donation drive. Asking your co-workers, friends, and family or club members to donate a few items is an easy way to contribute without spending a lot of time. Items that are always needed (and greatly appreciated) can be found on our Wish List. 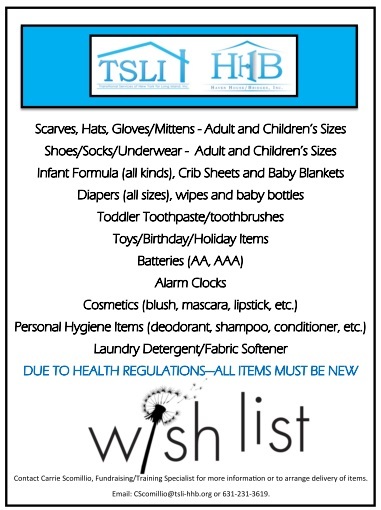 For All Ages: Scarves, Hats, Gloves/Mittens, Shoes/Socks/Underwear, Toys/Holiday items.